Gases — Natural gas, propane, butane, methane, acetylene, carbon monoxide, hydrogen sulphide. Flammable gases are usually gases with a lower explosive limit of less than 13% in air, or have a flammable range in air of at least 12%. For example, butane is a flammable gas because its lower explosive limit in air is 20%. Carbon monoxide has a lower explosive limit of 13% and upper explosive limit of 74% in air, it is flammable over a range of 61%. Liquids — Many solvents such as acetone, alcohols and toluene, paints and paint thinners, adhesives, degreasers, cleaners, waxes and polishes. Flammable liquids have a flashpoint below 37.8⁰C (100⁰ F). Solids — Some types of coal, pyrophoric metals (metals that burn in contact with air or water, such as sodium and potassium) solid wastes that are soaked with flammable liquids (rags, paper, spill clean-up products) and matches. For a fire to occur, there are three elements that must come together at the same time and in the right proportions, fuel, heat (ignition source) and oxygen. Remove any of the elements and the fire will go out. The “fire triangle” is commonly used as a model to understand how a fire starts and how it can be prevented. Fuel — Fuels are flammable or combustible materials and can be gases, liquids or solids. Heat — These are ignition sources and include an open flame, lit cigarette and sparks (such as from electrical current and static electricity shorts). A chemical reaction that creates heat can also ignite a fuel and oxygen mixture. Oxygen — The most common source of oxygen is air, but oxygen can also come from chemicals called oxidizers. Examples of common oxidizers are some types of acids and chemicals such as chlorine, chlorine dioxide, potassium permanganate and potassium chlorate. The spread of fire is also dependant on a fourth factor, the chemical chain reactions that occur after the fire is started. Fire prevention consists of making sure that the three legs of the fire triangle never meet. It is important to note that a fire will not always start even when the legs of the triangle meet unless all three elements are present in right amounts. For example, vapours from a flammable liquid must be mixed with a certain amount of air and exposed to the right amount of heat to ignite and burn. Once vapours from a flammable liquid have ignited, the flames may “flash-back”. This means the flames travel back, through the vapourair mixture, to the container or source of the flammable liquid. This can create an explosion. 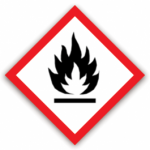 Most flammable liquids produce vapours that are heavier than air. Some flammable gases are also heavier than air. These gases and vapours can spread a considerable distance along the ground or floor and be ignited by a distant spark or flame or source of heat. Certain chemicals such as organic peroxides (e.g. benzoyl peroxide) contain both fuel and oxygen. The employer must develop work procedures for the use and storage of flammable materials and ensure workers are trained on these procedures. Because of the potential fire hazard, the employer will also need to have additional procedures in place to deal with fires and spills. In general, flammable materials must not be stored near exits, electrical equipment or heating equipment. They should always be stored in a separate, well-ventilated storage area, away from potential sources of ignition. If the material is removed from its original container, it must be placed into a container that is appropriate for flammable materials. Pressure release valves or spring closing lids with spout covers. A reference to the “SDS” material safety data sheet for the product. 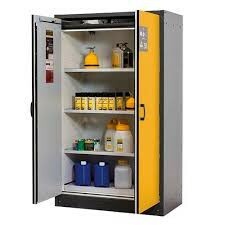 When individual containers of flammable liquids are not in use, and are stored inside a building, they should be stored in a storage cabinet. The European Standard EN 14470-1 was implemented in April 2004 and has since been published as a national standard in many European countries as the Netherlands, France, Ireland, Spain, UK, Italy etc. 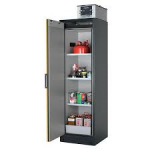 Since the 1st of January 2005 the former German Standard DIN 12925-1 can no longer be taken into consideration for testing Safety Storage Cabinets. Test and construction requirements, compared to the DIN 12925-1, have become stricter and in some details stated more precisely. The following points describe the basics and main safety, test and construction requirements. 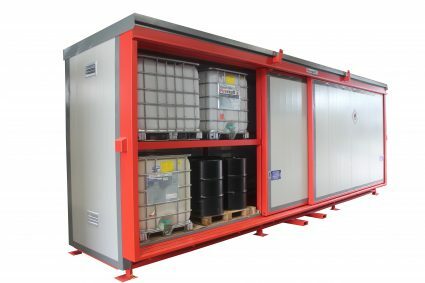 – The standard specifies the performance required of the design and fire resistance of safety storage cabinets used for storing flammable liquids in working areas. – Minimisation of the fire risk associated with the storage of flammable materials. – Protection of the contents of the cabinet in the event of fire for a known (and tested) period of time. – Minimisation of the fumes released to the working environment. – Retention of any possible leakage within the cabinet. stored materials turn a small, fire into an uncontrollable blaze. – In the event of a fire the cabinet must ensure that, over a period of time defined by the manufacturer (but in any event at least 15 minutes), its contents do not present an additional risk that the fire will spread. – The cabinet doors must close entirely, starting from any position (closing time max. 20 seconds). – Immobilising equipment fitted must release the locked doors at a temperature of 50 (-10) °C. – Avoiding risk of injury: the closing force of the doors must not exceed 100 N.
– One-handed operation must be possible, and the doors must close entirely even if open and locked. – The side and rear walls of the cabinet must have the same thickness and comparable structures. – The cabinets must have openings for air inlet and outlet (for connection of the cabinet to an exhaust system). – The ventilation openings must close automatically at a temperature of 70 °C. – Storage surfaces must be able to support the loading specified by the manufacturer over the period of the test in the furnace. Design evidence of the load-carrying capacity of shelves and drawers in the event of fire based on EN 1365 (fire resistance tests for self-supporting components). – Must be investigated by tests on a design sample. – The fire resistant cabinet is exposed to flames in a suitable furnace. – The doors, walls and ceiling of the cabinet being tested must be exposed to the same heating conditions. – Cabinets must be tested as free-standing single cabinets. The example being tested must be positioned with its rear wall at least 100 mm from the furnace wall. – The flame exposure is carried out in accordance with the standard temperature curve of BS EN 1363-1. – The temperature rise is measured inside the cabinet. – The cabinet must then be classed as type 15, 30, 60 or 90, according to the time that has elapsed before the temperature rose by 180K. At some work sites, there are many different types of flammable materials or large volumes of particular materials used. At these sites, flammable materials may be stored in large containers (drums or tanks) or there may be a specific flammable material storage room. The specific requirements for above ground storage tanks and storage rooms is HSg51. Do not store other types of chemicals beside bulk storage containers for flammable materials or in storage rooms for these products. Bulk storage containers should be located away from potential ignition sources such as heat, sparks or open flames. Do not store compressed gases beside flammable material containers. Bulk storage areas should be equipped with spill protection. Bulk storage areas and rooms must have appropriate signage or placarding. Smoking should never be allowed near flammable material storage areas. Drums or large containers of flammable materials should never be stored beside exits or in a way that blocks access. Make sure that storage rooms have properly designed ventilation systems that are regularly maintained. Minimum separation distances from occupied building, boundary, process unit, flammable liquid storage tank or ignition source (metres) Fig 1. Use intrinsically safe and non-sparking tools It is important that the employer assess the work site and identify potential fire hazards. This will allow the employer to identify the best ways to control these hazards. Static electricity is an electric charge that cannot move. It is created when two objects or materials that are in contact with each other are separated. While the objects are in contact, the surface electricity charges try to balance each other. When the objects are separated, they are left with either an excess or shortage of electrons, causing them both to become electrically charged. If these charges do not have a path to the ground, they are unable to move and becomes “static”. If static electricity is not quickly removed, the charge will build up. Eventually, it will develop enough energy to jump as a spark to some nearby less highly charged object. In an explosive or flammable atmosphere, the spark can set off an explosion or fire. The danger is greatest when flammable liquids are being poured or transferred. Flipping a light switch on or off. Bonding and grounding are techniques that are used to prevent sparks (a source of ignition) from being created when liquids are transferred between containers. Bonding is when there is an electrical connection between two or more conductive containers. Bonding ensures that the containers have the same electrical charge. Without a difference in charge a spark cannot be created that jumps from one container to another. 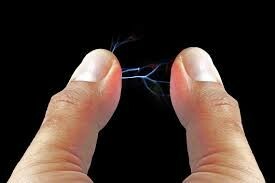 Bonding does not eliminate the static charge which is why it is used in combination with grounding. A container is grounded when there is an electrical connection between the container and the earth. Grounding quickly drains away the static charge.